Gun-related fatalities are a problem in Washington state: Within the past few years, 665 people on average have died each year from firearm injuries—more people than were killed in car crashes. Even more sobering is the fact that 80 percent of these gun-related deaths were suicides. On Jan. 6, Washington Gov. 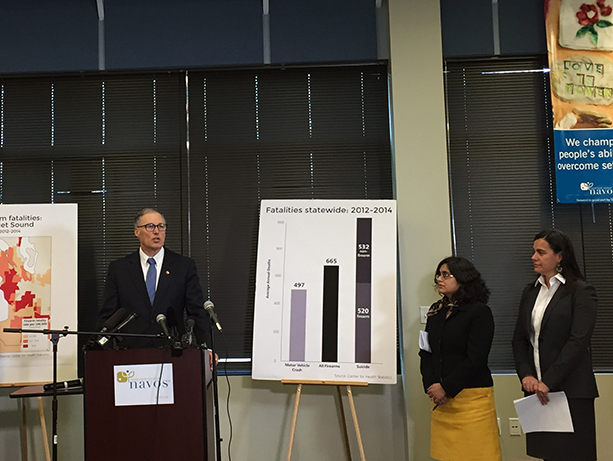 Jay Inslee announced a new public health initiative to prevent gun violence and related fatalities. The initiative arrived in the wake of President Obama’s Jan. 5 announcement of a gun violence-prevention executive action. Inslee’s initiative has multiple aims, among them reducing the rate of firearm suicides and conducting research to gather data on who is most at risk for gun violence and how they can best be aided. Inslee is partnering with community organizations, including the Harborview Injury Prevention and Research Center and the University of Washington’s suicide-prevention program, Forefront. Monica Vavilala, UW professor of anesthesiology and director of the center, was a guest speaker at the press conference announcing the initiative, along with Jennifer Stuber, UW associate professor of social work, who lost her husband to firearm suicide. Vavilala emphasized the importance of reaching out to people who are at higher risk for firearm suicide; she also stressed the importance of safe gun storage. The center will develop a social media program to reach out to people in King County who are at higher risk, and provide education and resources. On the other end of the gun-violence spectrum are mass shootings, the motives for which Vavilala admits researchers are still grappling to understand. She recently spoke to KING 5 about this equally serious issue and the common misconceptions people have about mass shooters. Until research can shed light on what distinguishes someone who will commit a mass shooting and determine what can be done to prevent them from taking this action, Vavilala said one preventive measure is the same one that can save the lives of people who are thinking of killing themselves: Lock up your guns so they don’t accidentally fall into the wrong hands. For more information about safe storage of firearms, visit lokitup.org.